As I laced up for a 20-miler in preparation for my second marathon, I couldn’t help but take a moment and reflect on the journey. Purpose has always been an essential tenor for me; constantly digging for my “why,” navigating toward my end-game, learning from mistakes, and pushing outside my comfort zone. All of those elements have been critical, but there was one facet that I doubled down on over the last 3 years – and that was my TEAM. When you think about “team” as it pertains to a personal journey, you likely think of family, close friends, and the people you consult before making decisions. What if I told you that over the last couple years, many of the players on my TEAM were complete strangers in a dark room on a bike at 6AM, with an instructor encouraging me to push myself to unknown destinations? It was in that dark room where the instructor recited the words “I can, I am, I will” and it was in that room where personal reflection transcended the scoreboard – and that reflection inspired me to set goals, which then unleashed a potential I never tapped, ultimately allowing me to take steps to pay it forward. In 2015, I signed up for a half marathon. 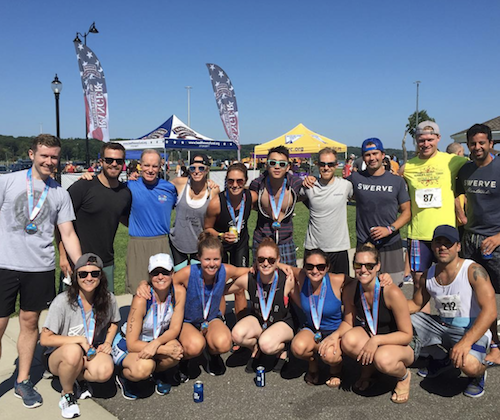 It was my first race and despite all the positivity around me, I had my fair share of doubts Thoughts that constantly clouded my mind: “I’m not a runner,” “13 miles is crazy,” and “I peaked athletically in the spin studio." Race day came and when I found myself at the 10-mile marker, I was starting to lose momentum. Subconsciously, I found myself repeating the words of my instructor, “I can, I am, I will” and next thing I knew, I was given my first medal. I made sure to text the instructor after the race to let her know how instrumental she was to my achieving that goal. It was after this race that I embraced the importance of celebrating small wins. Fast forward 2 years and that half marathon led to a dozen more races across the country. I ran the majority of those races alone, always sharing stories of my experiences with my team. Eventually, these conversations led to my entry into the triathlon world through the SWERVE Tri Club, embarking on a new journey with strangers from that dark room. 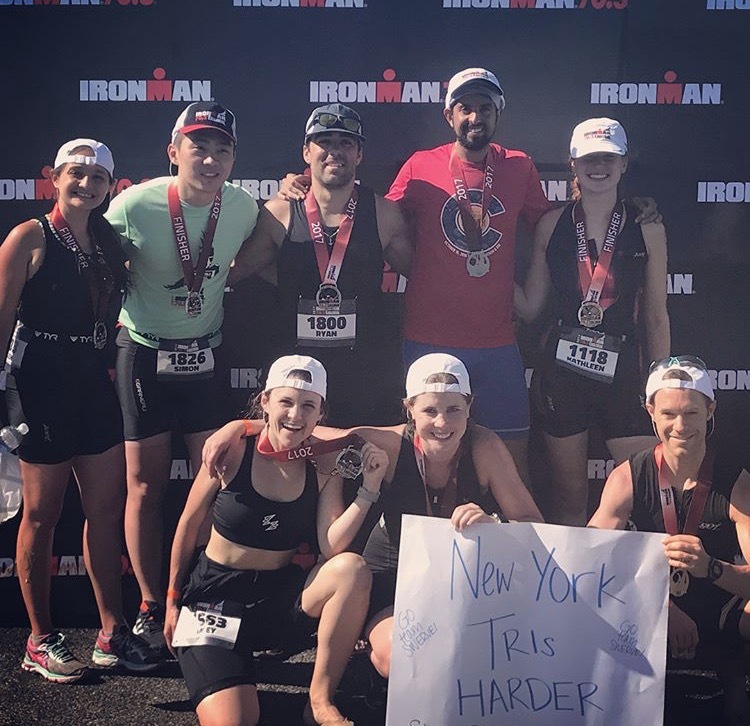 These strangers officially became teammates and encouraged me to get comfortable with something that made me very uneasy – while I had embraced running, I certainly was not a swimmer. I made the decision to limit my social life and focus on myself during the months of training in order to prepare my mind and body for what would prove to be a daunting experience. People around me would ask me why I was doing this, and to be honest, I had no answer – but I would think of my TEAM and all I knew was that backing out was not an option. In June, race day approached and as it turns out, the race is actually the easy part. The challenge is in those months of training – of working out twice a day, forcing yourself to get up early on cold mornings, telling your friends that you are busy on weekends, incorporating new diets hoping one of them syncs with your training regimen. You can consult all the pros and read all the books but at the end of the day, it’s on you to look at yourself in the mirror and commit. So there we were in Maryland on a Sunday in June. The forecast showed 93°F, and the race was about to kick off, beginning with the swim portion. I had two rules for the swim: 1) You can slow down but do not stop and 2) No matter what, do not look back. I abided by both and completed 1.2 miles in the Choptank River. My mind was at ease. I removed my wetsuit and transitioned to the bike portion. Around mile 40 (of 56), I looked down, I realized that every inch of my skin was covered in salt from dried sweat and dehydration. I was hot, I was tired, and I began to question myself, doubting that I belonged on that course. But right on cue, that familiar refrain began to loop in my mind: “I can, I am, I will.” In that moment, I knew that no matter what it took, I was going to finish this race and I broke down the final half of the race into small goals. I crossed that finish line with unexpected mental clarity; suddenly, I understood why I competed in this race. That moment of doubt – which I began to refer to as my “mile 40 moment” – wasn’t just about me completing a Half Ironman. It was about conquering self-doubt, finding motivation within myself, and doing whatever it takes to achieve a goal. Now, I wanted to share this story, spread this message, and empower others to conquer their own challenges. But how could I do this? A couple weeks after that race in June, I decided that I was going to run the New York City Marathon. In order to gain entry, I had to fundraise for charity. Something inside me was determined to use my experience in Maryland rally others around the concept that no challenge is too big and that barriers are meant to be broken. I put pen to paper and I reflected; where did I find the strength at mile 40 and why do I feel so strongly about this message? As an immigrant child who battled years of Leukemia, the act of overcoming obstacles was no stranger to me. Physical, social, and mental obstacles over the years have taught me lessons of patience, perspective, and purpose – so I wrote my story, combining my childhood battles with my mile 40 moment, and posted it on my marathon fundraising page. I was hesitant to share my personal journey. Maybe it wouldn’t resonate with people or maybe this vulnerability will just come off as weakness. But I decided to go for it, publishing my story to my page and setting a goal to raise $3k for the Leukemia & Lymphoma Society. Later that week, I shared my post with a mentor, who previously had no idea about my story. His response: “You need to aim higher.” He gave me my first donation and opened the door to the next monumental experience in my life. My fundraising soon his $5k, then surpassed $10k. Soon enough, my story went viral and media outlets were reaching out to highlight my efforts. Eventually, my TEAM raised over $50k. Beyond the monetary results, I was touched every time I was told that my story nudged others to share their own experiences. It allowed others to become comfortable with the uncomfortable and was a reminder that once you exit that comfort zone, you are opening yourself to untapped potential. A year since my first marathon and a year to think back on this journey, I would be remiss if I didn’t remind everyone that it all started in a dark room on Wednesdays at 6AM with strangers. I was not a runner, my goals were unclear, I embraced my comfort zone, and I was not compelled to share my story. I encourage you all to seek out the TEAM that will push you, to celebrate small wins along the way, to keep learning about yourself and the strength within. Before you know it, you will conquer your mile 40 moment and you will undoubtedly cross that finish line. SWERVE On!